Win 2 Tickets to SM Ladies PFW Show! 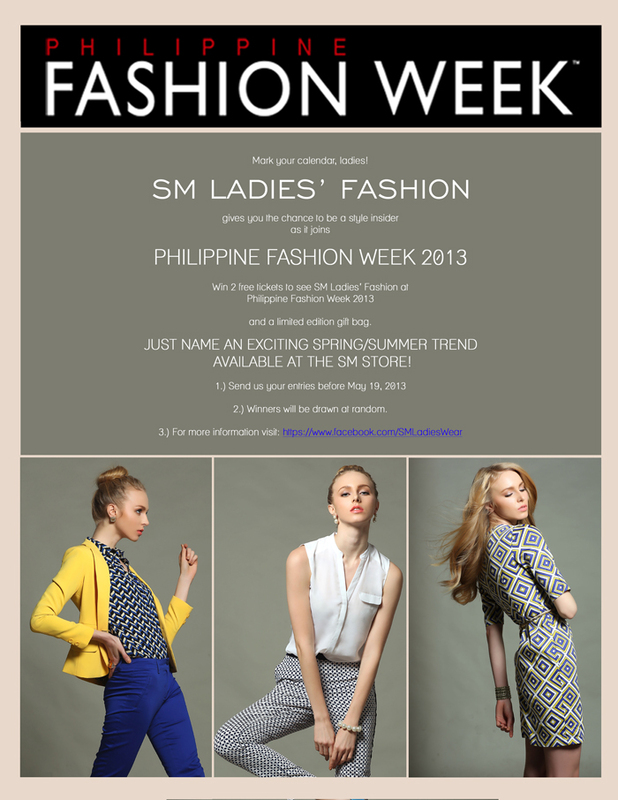 SM Ladies’ Fashion is opening Philippine Fashion Week with a bang! Florals, geometric patterns, Asian-inspired cuts, and more are only a few of the trends fans can expect to see at this year’s clothing extravaganza. With well-loved brands SM Classics, Folio, Weekender, Studio S, Philosophy, and Coco Cabana taking center stage, there’s certainly a lot to look forward to. In line with this event, SM Ladies’ Fashion is giving fashionistas everywhere the chance to experience Philippine fashion’s biggest celebration. Participants can name any SM Ladies’ Fashion trend for Spring/Summer ’13 and get a chance to win two (2) tickets to Philippine Fashion Week along with an SM Ladies’ Fashion gift bag. 1) Must be a reader of this blog. "Want to watch the @SMLadiesFashion PFW show next week? Join @paxieness giveaway! http://goo.gl/xb3sO"
Winners will be announced on May 20. Goodluck and see you there! Florals and prints are on trend this season! I love the Sport Color trend! Bold nautical stripes and breezy tailored bottoms in Summer brights from WEEKENDER! Trend: FLORAL EVERYWHERE! Floral skiiirts! Geometric Prints! And Dip Dyed!! I would L❤❤❤❤VE to go to the PFW!! !